KATHMANDU: Stocks saw significant strength in the initial trading session on Tuesday with the Nepal Stock Exchange (Nepse) Index adding almost 7 points. The index pulled back slightly in the afternoon erasing most of its earlier gains. Nonetheless, the index rose towards the final trading hours posting a gain of 7.43 points. At the close, Nepse settled at 1,224.36 points. The gain seen on the day helped the market recoup some of its losses from the earlier session. 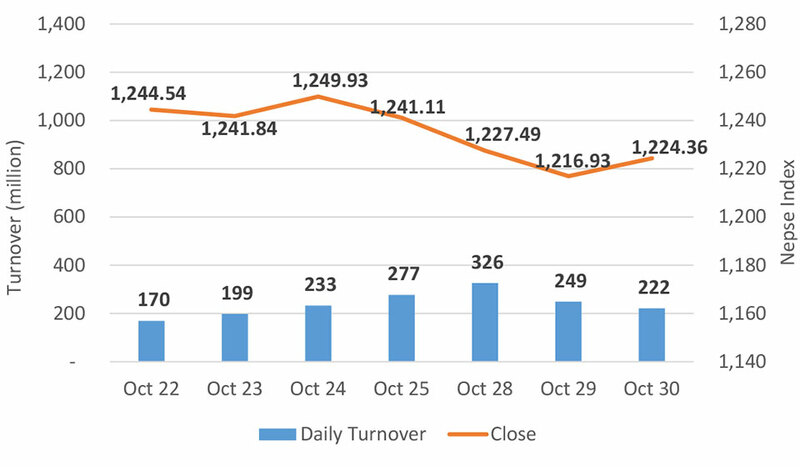 Even though Nepse broke its three-day losing run, market activity dropped on the day. The bourse recorded a turnover of over Rs 221 million against Rs 249 million in the previous session. Most of the major sub-indices ended the day in green while only Hotels, Hydropower and Microfinance stocks declined. Banking stocks turned in some of the best performances of the day with its sub-index rising 0.85 percent. Similarly, Development Bank and Others sub-indices climbed 0.7 percent. Besides, Manufacturing and Processing and Life Insurance sub-indices also closed higher by 0.58 percent and 0.43 percent, respectively. Prabhu Bank Ltd led the list of top turnover stocks with a total transaction of Rs 18 million. Shares of Life Insurance Company Nepal Ltd registered a turnover of Rs 17 million. Other commercial banks including, Mega Bank Ltd, NMB Bank Ltd and Janata Bank Nepal Ltd posted turnovers of over Rs 8 million, each. NIC Asia Bank Ltd, Bank of Kathmandu Ltd and Nepal Life Insurance Company Ltd's scrips were also actively traded on the day. Shares of Nepal Seva Laghubitta Bittiya Sanstha was the biggest percentage gainer as its price hit the upper circuit of 10 percent. Nepal Hydro Developers Ltd also posted a significant move to the upside with its share price gaining 8.40 percent. Similarly, Mission Development Bank Ltd, which declared 11 percent stock dividend on Monday, saw its share price jump 6.10 percent. Shares of Taragaon Regency Hotel Ltd also advanced 5.18 percent. Himalayan Distillery Ltd, Jalabidyut Lagani Tatha Bikas Co. Ltd and Shine Resunga Development Bank Ltd were among other top gaining stocks. Among the decliners, shares of Api Power Company Ltd fell the most and lost 4.74 percent on its price. Shares of Ridi Hydropower Company Ltd and Hathway Finance Company Ltd followed suit and closed down 3.63 percent and 3.36 percent, respectively. Energy stocks including Himalayan Power Partner Ltd and Khanikhola Hydropower Company Ltd also fell over 3 percent each. Meanwhile, NMB Microfinance Bittiya Sanstha Ltd and Civil Laghubitta Bittiya Sanstha Ltd sank more than 2 percent apiece. On the earnings front, Global IME Laghubitta Bittiya Sanstha Ltd and Samata Microfinance Bittiya Sanstha Ltd reported a growth in their respective net profits as per their first quarter financials of Fiscal Year 2018/19. While the former saw a significant increase of 178 percent in its earnings, the latter's net profit grew by a decent 44 percent margin. Meanwhile, Saptakoshi Development Bank Ltd's net profit fell by 43 percent year-on-year. ARKS technical analysis indicates the market forming a bullish candlestick on daily timeframe. Subsequently, the index bounced from its support level of around 1,215 points. However, technical indicators suggest that the momentum is still in favor of bears. Given the index trends above the current level, the index might reach the resistance of 1,250 points. However, further slump might see the index fall to 1,200 points level.